Congratulations to our winner, @ambereatsveg! Week 2 of VeganMoFo 2017 is all about Behind the Scenes – the gadgets, tricks and secret ingredients that help you to produce your culinary masterpieces. While we’re thinking about the processes in the kitchen, it seems like the perfect time to run a series of cookbook giveaways courtesy of the wonderful people at Vegan Heritage Press. Vegan Heritage Press is an independent vegan publishing company which is no doubt behind some of your favourite recipe books – check out their published authors here! They are staffed by vegans and are doing great work meeting the growing demand for vegan cookbooks. From Monday to Friday this week we’re running a daily giveaway of one of Vegan Heritage Press’ new titles. 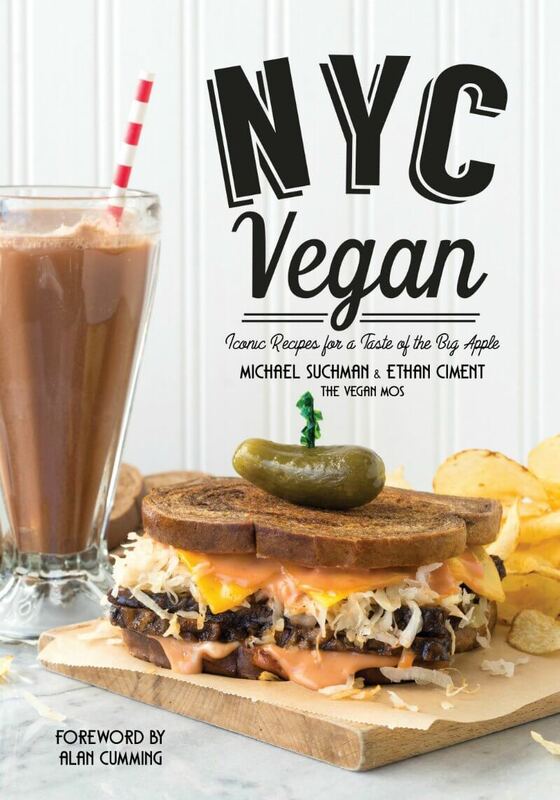 On Thursday, we’re giving you the chance to win a copy of NYC Vegan by Michael Suchman and Ethan Ciment. Michael and Ethan (who also blog at VeganMos.com) are native New Yorkers sharing recipes inspired by Old New York, delis and diners, Jewish specialities, and more! They’ve got recipes like knishes, soft pretzels and New York-style cheesecake. Delicious! For your chance at winning, leave a comment either here on our Instagram post telling us: what’s your favourite New York dish? We’ll choose a winner at random. This giveaway is only open to participants in the USA who are registered for VeganMoFo. Participants are allowed to enter all five giveaways this week, you don’t need to limit yourself to one. The competition closes at midnight Pacific Daylight Time. Good luck! I live for vegan sushi. My favorite NY food that I currently go to NYC to eat would be pickles and bialys. What I miss most are black and white cookies. Everything bagel from Ess-a-bagel on 3rd avenue. Scallion tofu cream cheese, please! I’m all about that NY cheezecake life! Bagels and Reubens. I love trying new vegan reuben recipes! Feed me a Jamaican Jerk Pattie or a Knish. Haven’t had one since going vegan, but I know it is possible! Bagels. Or pizza. Neither taste quite the same anywhere else! Reuben! If I were on death row I would make my last meal a Reuben. my favorite New York dish is hot nuts! I have not been to New York. So I am open to the tastes I hear about. Rueben would be one of the big go to. I have not been to New York. So I am open to the tastes I hear about. Reuben would be one of the big go to. I’ve never been to NYC, but I’ve always loved NY style pizza. I’m torn. Pizza is so iconic, and I’m partial to NY-style pizza. However, on my first trip to NYC Iwas most impressed that the city could support a restaurant dedicated to rice pudding, From Rice to Riches. Now, Brooklyn has Isa Chandra Moskowitz’s Modern Love…. oh the choices!